Start Traditional starting location. From the intersection of highways 50 and 89 in South Lake Tahoe, drive 4.7 miles northwest on Highway 89 to Spring Creek Road and turn southwest (left) onto it. Drive 1.0 mile to the end of the road and the starting point (mileage point 8). In recent years a gate at the bottom of Spring Creek Road has been locked during the winter months. New starting location. From the intersection of highways 50 and 89 in South Lake Tahoe, drive 4.5 miles northwest on Highway 89 to a turnout on the north (right) side of the road. This parking area fills quickly. The next closest parking area is 0.5 mile east at another plowed turnout (mileage point 9). This route to the summit of Mt. Tallac is the favorite of Tahoe’s telemark and AT ski crowd; it's also popular with boarders and on occasion downhill skiers endure carrying their skis to the summit for the pleasure of the grand descent down the northeast bowl – almost 3000 feet of steeps in just over one mile. This tour follows the most direct route to the summit of Mt. Tallac. After negotiating the lower, less steep terrain, it ascends the very steep northeast ridge of Mt. Tallac that lies to the north of the bowl. You will find the route tracked unless you get up very early after a new snowfall. Without question the number one draw is the more than 3000-foot descent from the summit of Mt. Tallac. But the panoramic view from the summit is astounding and worth a trip in itself. Nearby are dazzling blue Lake Tahoe, Cascade Lake and Fallen Leaf Lake. Across Lake Tahoe is the Carson Range. Turn around and Desolation Wilderness lays before you with Pyramid Peak looming on the horizon. From below on Highway 89 and elsewhere in the Lake Tahoe Basin, the face of Mt. Tallac is obvious to everyone familiar with it. Some people say that a cross of snow is visible on its face winter and spring. Before the boom in telemark ski equipment and more recently AT ski equipment, the ascent of Mount Tallac was not popular. More often than not those who climbed it carried their downhill equipment to the top. With new equipment a whole new sport evolved and has grown at an amazing pace. Mt. Tallac quickly became one of the premier destinations for those seeking the exhilaration of challenging steep backcountry terrain in the Lake Tahoe Basin. We're not talking about a dozen people on a nice weekend day. We're talking about 20 or 30 car fulls of skiers on a weekend day. It appears that the congestion and parking problems created in the Spring Creek Road development by this large use resulted in the road being gated closed in winter with access only to residents. The result was that the traditional starting point was replaced with a new one on Highway 89 as described in the summary section for this tour. Of course you can carry your equipment to the traditional starting point to begin the climb from there, but few if any do so it is not described here. With all this interest in Mt. Tallac it is not uncommon for the traditional route down through the north bowl to be tracked out soon after a snowfall. There are other less used routes down but they are not described here. You may want to consider going to Waterhouse Peak or Powderhouse Peak if you find Mt. Tallac too intimidating or too crowded. These fine peaks offer excellent downhill terrain, retain their powder conditions long after the last snowfall, have lots of routes down to choose from, and parking is abundant and adjacent to the start of the climbs. Of course they offer only slightly more than half the vertical descent of Mt. Tallac but you can do them twice in a day. An alternative route to the summit of Mt. 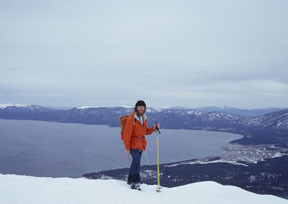 Tallac is described in the Mount Tallac Via North Ridge tour. No matter what route you follow to reach the summit, the descent down the north bowl should only be skied when avalanche conditions are not present. The slope in this section is in the 20- to 25-degree range, which puts it in the prime avalanche range. An interesting one-way tour can be created by ascending Mt. Tallac and descending south and then east to Fallen Leaf Lake; in effect you cross Mt. Tallac. This route is described in the Mount Tallac to Fallen Leaf Lake tour. From the trailhead (1) ski southwest for 0.5 mile until you reach a ridge (2). Ski south up the ridge and when it levels veer to the west (right) for a total of 1.0 mile until you reach the creek draining Floating Island Lake (3). Ski west for 0.3 mile until you reach a second creek (4). 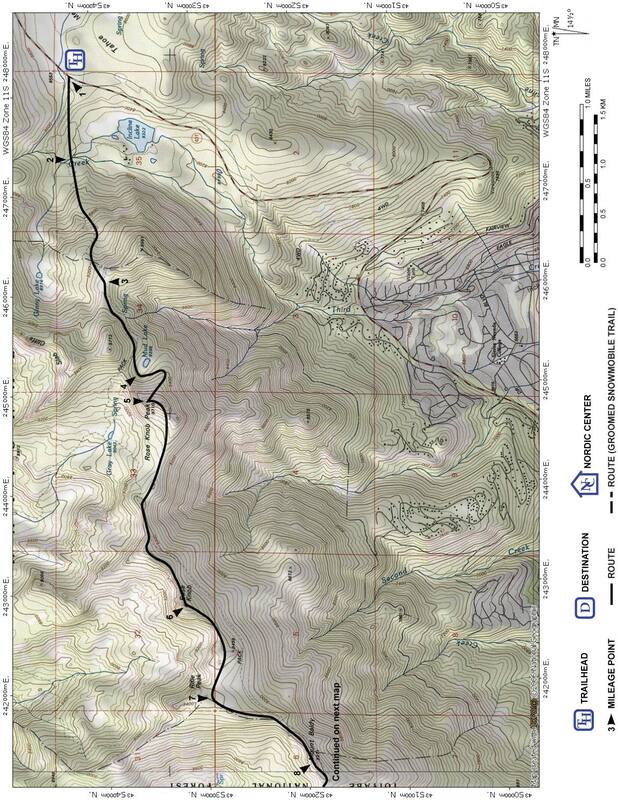 Ski slightly north of west for 0.3 mile until you reach a third creek (5) at the east end of a small flat area. Start by skiing northwest but shortly curve to the southwest for a total of 1.0 mile until you reach the north ridge of Mt. Tallac (6). Ski south on the ridge and as you approach the peak ski around to and up the south slope of Mt. Tallac to its summit (7). Ski north down the main bowl and gradually curve to the northeast for a total of 1.1 miles until you reach the third creek and the route you ascended (5). In this section it is important that you avoid the cliffs on the east (right) side of the bowl. 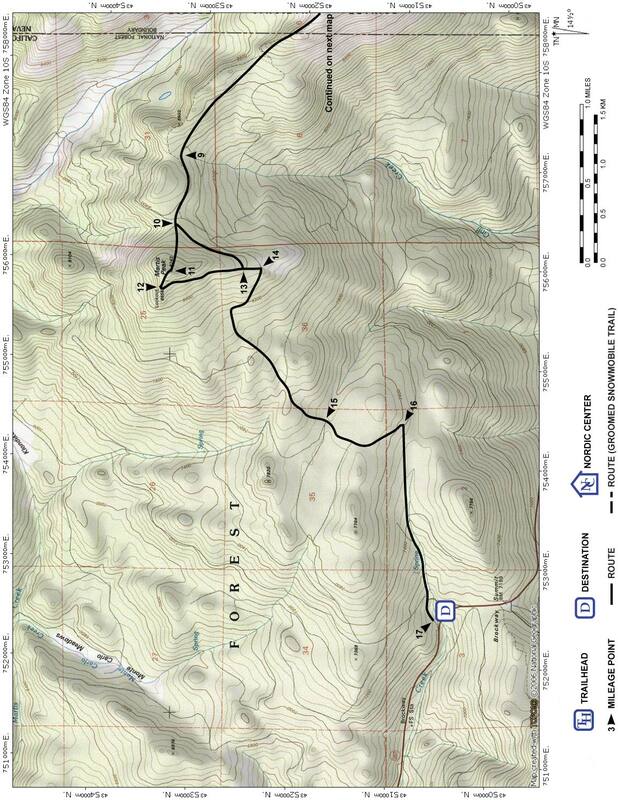 Retrace the route for 2.2 miles back to the trailhead (1).